It was the biggest game of the season, to date, and the Sabres needed a strong showing. They didn’t get one. 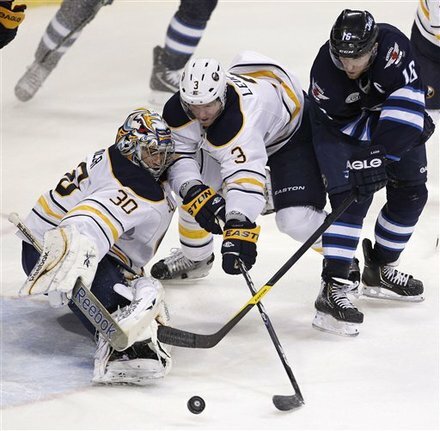 Buffalo looked flat for most of the game as they fell to the Winnipeg Jets 3-1. The Sabres were facing a tough battle from the get-go. The final game of a rough west coast trip, in one of the league’s loudest barns against a team they are chasing for a playoff spot. Perhaps the deck was stack in the Jet’ favor before the puck dropped, but there was little push from Buffalo’s side of the table all night. I don’t doubt that the fatigue factor played a major role in Buffalo’s performance, but it was just another one of those games where this group of players didn’t show up when they needed to. That isn’t necessarily a blanket statement, either. Ryan Miller had yet another impressive game (28 saves) and certainly gave his team a chance to get a victory. For the second-straight game in Winnipeg, Miller was strong and his team was flat. Once again the top line of Thomas Vanek, Derek Roy and Jason Pominville were non-existent and turned a pair of three-on-two rushes into odd-man goals for the Jets. Lindy Ruff responded by plunking Vanek on the bench and using Roy as his extra attacker late in the game (#LindyLogic). There can’t be too much overreacting put into this loss. Yes, it was a pivotal game. No, it doesn’t mean the season is over. Bottom line, it makes the journey to eighth that much harder and things would be a whole lot different if this road trip was finished 4-0-0. It is about time Jhonas Enroth play an entire hockey game. Lindy Ruff was sort of forced into sticking with Miller. A pair of shutouts and generally awesome hockey kept Buffalo’s starter off the bench. However, running MIller into the ground will accomplish little. Show faith in Enroth and let him reward your decision. Two effective goaltenders are always better than one. I don’t care if Enroth plays Wednesday or Thursday, just get him in a game and do it soon. Also, with regards to Lindy’s decision making. It is about time to do a little line shuffling. Whether or not Derek Roy’s presence has been what dragged down Vanek and Pominville, I think it is time for a new look. Cody Hodgson has been strong with Tyler Ennis and Drew Stafford, but maybe he can help spark Buffalo’s two best scorers. Try this on for size: 26/19/29 – 23/63/21 – 42/9/36 – 37/22/78. Robyn Regehr needs to hit Chris Thorburn on that third goal. Ryan Miller is standing his ground as a third-line grinder came to the crease with no option. Miller’s read is to hold his position and make the easy save. It is Regehr’s responsibility to deny the inside ice for Thorburn, that didn’t happen and suddenly Thorburn is the new Gretzky. To that point, I have noticed the NBCSN crew getting on every pretty play more and more. I usually appreciate what Pierre McGuire has to say, but he is getting a little over the top with the major junior, college and European development references. He has a plethora of hockey knowledge, just use that and inform the viewers as to what they’re watching. It is hard to pinpoint exactly who was good and who wasn’t for the Sabres. Mainly because most of the team wasn’t very good. All six defensemen had their struggles and most of the forwards were average. It was just a flat night for this team and they paid for it. I love the fact that the MTS Centre crowd is loud and raucous for the entire game. It is a perfect combination of a hockey-mad city, loud fans and I would assume timely video/music choices. I’ll wait to see if the atmosphere at FNC changes for the better, but I don’t think many Sabres fans have it in them. I agree. Sabres were tired. 4 games in 6 nights. They still don’t score. And yes the NBC crew are homers wherever they are. McGuire needs to shut up and come up for air once in a while!